There's plenty to be said about this beer. For a start, it's the second beer in Bad Shepherd's Brew Crew Series, which sees them invite a staff member who isn't a brewer to help design a beer; the first was barman Dan's ESB, with Dan followed into the hot seat by sales guy Scotty "Beardface" Thomson. 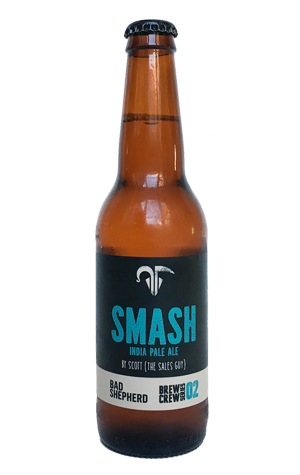 It's also a SMaSH beer – single malt and single hop. And that single malt has its own story as the one chosen is Schooner, a barley variety grown and malted in the Riverina region of New South Wales by young craft malting operation Voyager, of which you can read more here. As for the beer itself, it's the third IPA to leave the Bad Shepherd brewpub and comfortably the most delicate of the three. The single hop is Galaxy, itself a recently new Australian developed variety, which contributes its familiar tropical fruit character and some resinous backend bite. As for the Schooner malt, it lends the beer a silken smoothness and a soft sweetness that helps accentuate the fruitiness of the hops. Expect to see more breweries hooking up with Voyager as the business grows.